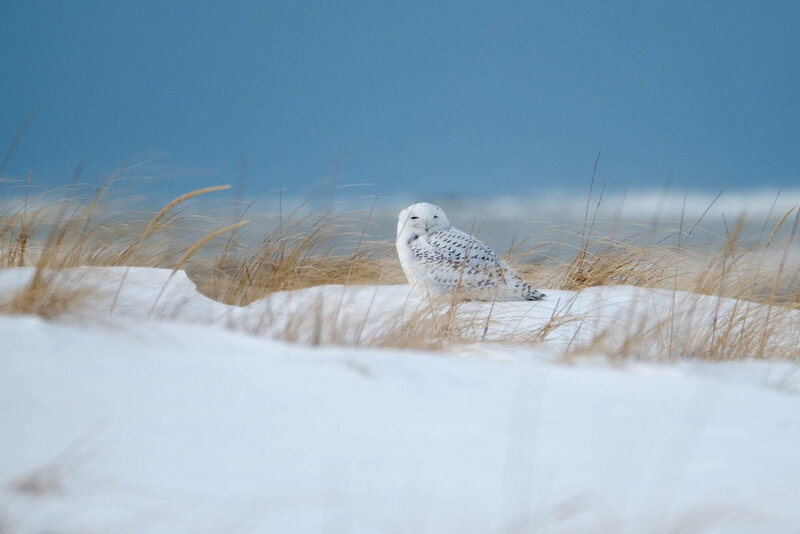 I used my last Holiday break day off to go Snowy Owl hunting (with a camera of course). A few years ago I captured my best Snowy pictures at Presque Isle State Park in Pennsylvania, so I decided to try my luck out there again. It’s kind of a big commitment and gamble to head out to this area. It’s at least a two hour drive to get there, with a minimum 4 mile hike. On top of that, Erie has been hammered with snow with about 1-2 feet, and no guarantee that I will even be able to drive out to the peninsula. As I got closer to Erie, the roads were getting dicey and the effects of the big Christmas snowstorm were still very evident. Luckily, the roads were plowed and I was able to drive all the way down the peninsula. So far, so good:) Last time I came looking for owls, in 2014, I stopped at many of the beaches scanning for owls before I finally gave up on the easy access stuff and found success at Gull Point. This time, I went straight to my best chances and decided to skip the pull off areas and just do the hike to Gull Point. The parking lot for the trail was not cleared so I had to park a bit further out on the road. After driving in the warm car for just over two hours, the bitter cold and wind really hits you in the face! That’s fine, I was dressed for it and determined to find some arctic visitors. Even though it’s cold and conditions are tough for hiking and photography, I expected to see at least a few cars of other birders and photographers out for the day. Instead, I saw nobody else, but did follow in the fresh footprints that mysteriously just ended about half way back?? The hike back seemed longer then I remember, but then finally...I broke through the trees to the wind sweeped landscape that is Gull Point. I almost immediately spotted a snowy and knew the whole trip would be worth it! He (I think it was he) was hunkered down behind some grass. I kept my distance while taking several photos as I moved past him further down the beach. The raptor was obviously aware of me, but didn’t seem bothered. I think it helps to not stop in one place for too long. After just a few minutes I saw two more white owls in the sky. It was amazing seeing these two soaring together. I fired off a few shots, but had no idea if anything would be in focus. The wind was really whipping up at this point and it had to be somewhere around -15 with the windchill. I didn’t have much more in me before I need to start heading back and find the shelter of the woods. The two flying birds soon landed on the beach not far from me and I was able to take cover behind some old tree roots and get some fairly close photos of the owls. 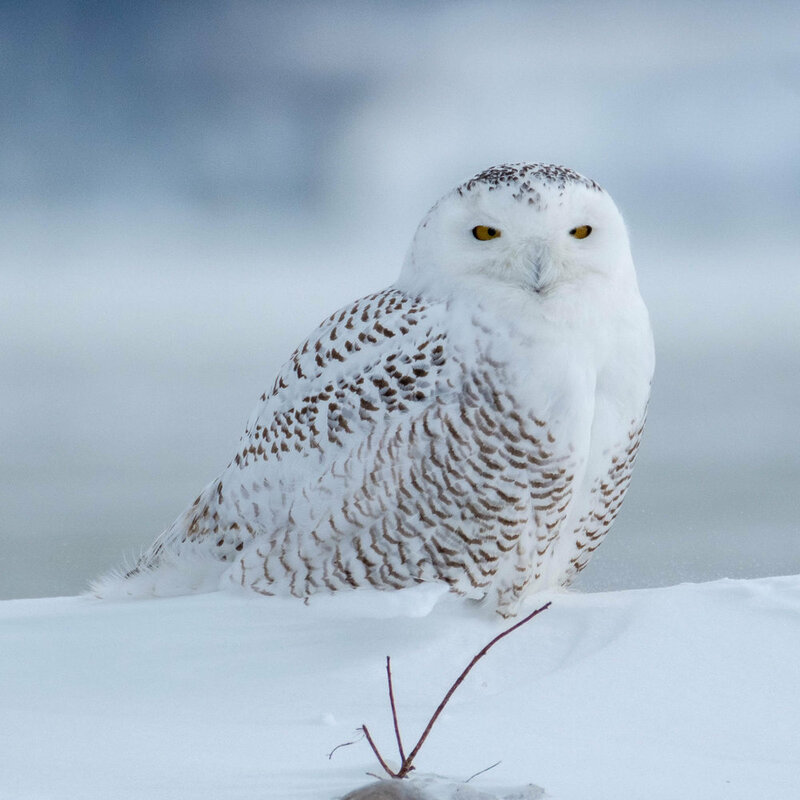 After just a few minutes it was time to get out of here and on the way back I grabbed, probably my favorite photo of the day of the original snowy owl who had moved a little closer to the trail by this time. Got a few landscapes on the hike back and had an easy drive home. Seven hours from door to door and it was all worth it. These majestic visitors from the far north are something special to see in person and I’ll make that trip every year that I can.